As one of the largest alumni associations in the world, serving more than 420,000 members across 13 nations, this extensive brand needs to be strong and clear. That’s why UFAA turned to our team for expert branding assistance. Our creation of the F Book is a critical first step in building brand connection with future alumni. This book of traditions is given to incoming freshman as a way to educate, excite, and ignite a flame of brand stewardship. Our team has worked with UFAA to plan and design a series of sub-group identities that give voice to important target audiences while supporting a consistent master brand strategy. From event communications to alumni collateral and much loved swag, we’ve created meaningful connections with key audiences. 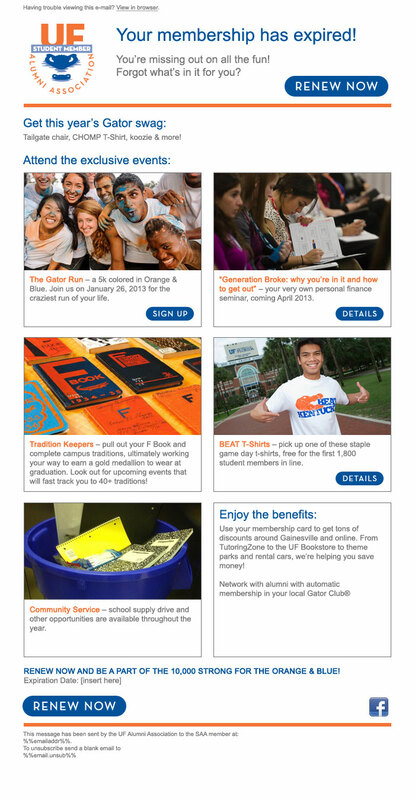 Our approach has embraced the greater Gator Nation brand while supporting the unique needs of each touchpoint opportunity.